Following years of customer demands, Netflix finally added the ability for mobile users to download and watch certain content offline late last year. But like all good things, this feature came with a couple of strings attached: firstly, there was the fact that even at the "Highest" quality setting the videos would still not be downloaded at their full quality. And now, as users are discovering the hard way, there also seems to be a limit to how many times you can download a certain piece of content. 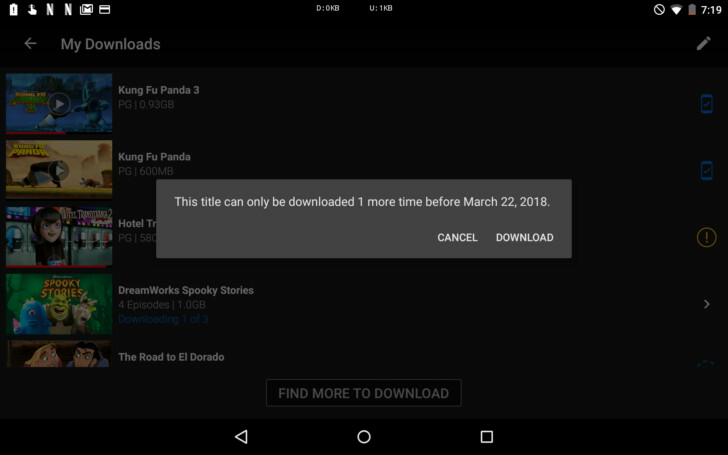 As reported by Android Police, this aspect of offline viewing only rears its ugly head when a user is just about to hit the download cap, with the app displaying a message that there's only a single download left until a given date. And to add insult to injury, since all downloaded content has an expiration date, after which it has to be "refreshed", the number of downloads quickly starts racking up even if you're only using the feature on a single device. Also, Netflix doesn't provide an exact number of downloads available to a user, though Android Police speculates it could be as low as 4-5 per year, depending on the licensing terms Netflix has negotiated. Of course, this is to be expected, given how stingy content providers tend to be when it comes to online consumption, but it would have been nice if Netflix explicitly provided such data to its users. So if you use the offline viewing option, make sure you only download titles when you need them, lest you accidentally reach the limit. Yeah. I notice this. Wonder why people pirate stuff?